I have four harps from which you may choose, based on where your event is taking place and the type of music you would like me to play. All of my harps were built in the United States. 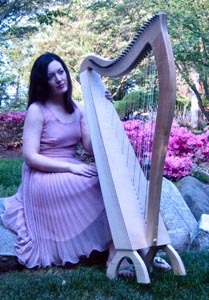 This harp is the most portable of all the instruments, and is used for providing music at most beach weddings or other venues that are difficult to access with the larger harps. It is available for any wedding ceremony and for non-wedding events. All music marked with a "+" on the repertoire list can be performed on this harp. It has 36 strings and was built by Dwight Blevins in Colorado. Standing about 4 and 1/2 feet tall, it has a natural maple finish and the appearance of a traditional Celtic / Irish harp. This is the harp that most often flies with me for destination weddings. Built by Bill Webster in Warren, Michigan, it can be used for any wedding, reception, party, church service, or funeral. All music on the repertoire marked with a "+" can be performed on this instrument. It stands 5 and 3/4 feet tall, and has 40 strings, and was built to my specifications in 2008. It has a matte ebony finish, and the column is wrapped in laurel leaves that are plated in 22k gold. 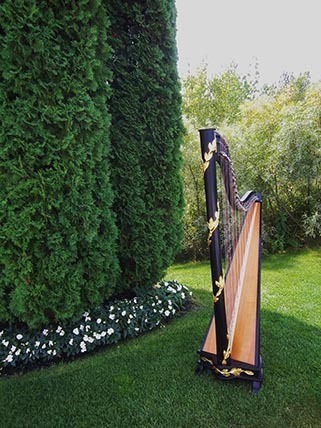 This harp has a modern design and a matte ebony finish. All music on the repertoire list can be played on this harp. 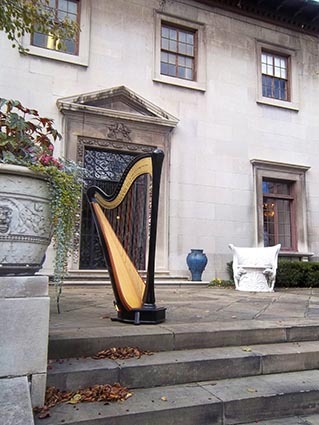 Made by W&W Musical Instrument Company in Chicago, this harp is nearly six feet tall and has 46 strings. It was built in 2007. 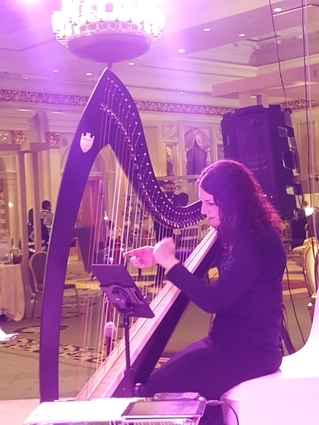 This harp is kept in Abu Dhabi, UAE, and is used for events throughout the Middle East and beyond. It can travel as oversize baggage on international flights out of Abu Dhabi or Dubai. It was built in Chicago, Illinois, has a matte ebony finish, 36 strings, and stands approximately 5 and 1/2 feet tall. All music marked with a "+" on the repertoire list can be performed on this harp.